Military buildup in the Persian Gulf, arms sales could undermine US-Iran negotiations. Here’s a worrying counterpoint to the progress in US-Iran talks: the United States is seeking a major buildup of its armed presence in the Persian Gulf, including stepped-up arms sales to the countries of the Saudi Arabia–led Gulf Cooperation Council (GCC). The GCC is essentially an anti-Iran alliance of the Arab kleptocracies of the gulf, including the flashpoint nation of Bahrain, where a Shiite majority population has been challenging the ruling Sunni monarchy—and where the US fleet in the Persian Gulf is based. The American strategy might not work too well, however, if Iran continues to reach out to the Sunni Arab states of the gulf seeking détente. Recently, Foreign Minister Javad Zarif toured several of those countries—but not Saudi Arabia, still sullenly hostile to Iran—seeking to improve relation with Kuwait, Qatar and the United Arab Emirates. (Iran already has good ties to Oman, another GCC member, and in fact Oman happily hosted secret talks between Iran and the United States in the period before the interim accord was reached in November between Iran and the P5+1.) In an important sign that Iran is genuinely seeking to better relations with the Arab states of the gulf, according to Defense News Iran has moved a squadron of air force and Revolutionary Guard warplanes off the disputed island of Abu Musa in the middle of the Persian Gulf. 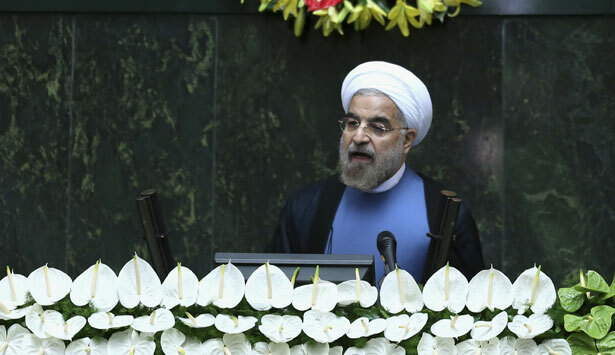 The island, occupied by Iran since the Shah seized it in 1971, has long been a point of contention between Iran and the UAE, and during his swing through the gulf recently Zarif told the UAE that Iran was willing to talk about resolving the standoff. Speaking to American sailors standing at attention on the deck of the USS Ponce, Defense Secretary Chuck Hagel vowed on Friday that the United States would keep a robust military presence in the Persian Gulf and build stronger ties with the region’s Arab states, even as it pursues negotiations with Iran over its nuclear program. There’s plenty of money to be made for America’s military-industrial complex in the Persian Gulf, where Saudi Arabia and the other kleptocracies have ordered tens of billions of dollars worth of US military hardware. As part of that longer-term effort, the number of coastal patrol ships based in Bahrain to conduct maritime security missions is set to double, to 10 ships, by next spring, from five vessels two years ago. Six Coast Guard vessels perform similar duties. Ship crews are now assigned one- and two-year tours, instead of rotating every six months. Speaking at the Manama Dialogue international security conference here, Hagel encouraged GCC members to create a military alliance and said he’d like to better integrate the US missile defense systems with those of the GCC to enhance collective capabilities. To be sure, the Obama administration is moving forward in search of a permanent accord with Iran, and President Obama himself said over the weekend that such a deal is within reach. But rattling sabers in the Persian Gulf won’t make the accord any easier. Read Bob Dreyfuss on the US-Iran deal.